Now operating in its 51st year, Mo-Kan Regional Council (Mo-Kan) is a designated regional planning commission and economic development district, recognized by the states of Kansas and Missouri and the federal government. Mo-Kan provides community and economic development services to 36 municipalities across 6 counties in northwest Missouri and northeast Kansas. Services include long-range community planning; grant procurement and administration; business loans; hazard mitigation; GIS; and homeland security. 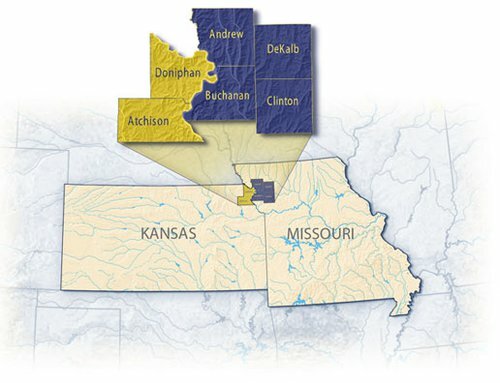 Mo-Kan Regional Council serves the county and municipal governments in four Missouri counties, two Kansas counties and one municipality in a non-member Kansas County: Andrew, Buchanan, Clinton and Dekalb counties in Missouri; Atchison and Doniphan counties in Kansas; and Morrill municipality in Brown County, Kansas. The concept of a regional council stemmed from the need to pool area resources for the purpose of securing professional services for counties and municipalities. One such service lacking at the time of conception was that of planning services for land use and zoning. Legislation providing for this pooling of effort was enacted in Kansas and Missouri in the 1950s and ’60s. In 1957, Kansas authorized county zoning and planning commissions, which could either employ a zoning officer or; in the less populous counties, contract for consulting services. In 1966, Missouri designated twenty areas permitted to pool planning resources. Included in the Missouri pooling zone were Andrew, Buchanan, Clinton and DeKalb (ABCD) counties. The ABCD Regional Planning Commission was chartered in February 1968. In June of 1968, the Doniphan County, Kansas, Planning and Zoning Commission sought membership with the Missouri Commission to create synergy in the outlying St. Joseph Metropolitan Area. Consequently, permission was granted to create the Mo-Kan Bi-State Planning Commission whose name changed five years later to the entity we now know as Mo-Kan Regional Council. Immediately seeing the value in the regional planning commission, the city of Atchison sought and was granted membership in November of 1968. Kansas membership increased with the addition of Atchison County and the city of Horton in 1974. In 1984, the cities of Hiawatha and Morrill also elected to join. Over the course of time, member governments developed a wider-range of needs other than that of long-range planning. Mo-Kan began providing services such as grant procurement and administration, as well as offset printing and cartography. It has continued to broaden its scope of services over the years. Brown County, Kansas, is not a member county, but the city of Morrill, Kansas, is a member municipality and is included within the core service area. It is this area within which the regional population and other data are based. Additional counties are served due to special programming and not included in the primary service area. The larger cities in the district are St. Joseph, Cameron and Savannah in Missouri, and Atchison in Kansas. Measuring from St. Joseph, the district is located approximately 50 miles north of Kansas City, 70 miles east of Topeka, Kansas, and 160 miles south of Omaha, Nebraska. Two interstate highways — I-29 and I-35 — and numerous federal and state highways serve the area. The Missouri River flows through the district and forms the border between Kansas and Missouri. The land area of the district is 2,512 square miles with a 2010 U.S. Census population count of 164,996. The population density is 66 persons per square mile. Median income is $49,724, with 13.17% living in poverty. Just under 90 percent of the area’s residents achieved a high school diploma, professional certifications or college degrees. As for the economic climate, over 12,300 businesses and their employees generate an annual payroll of over $2.2 billion. Mo-Kan Regional Council planning services are meant to benefit all citizens of the six-county core service area. The voting membership of the Mo-Kan Regional Council consists of 32 persons, 16 each from Missouri and Kansas. Kansas members are named directly to the council by Doniphan and Atchison counties and the municipalities of Atchison and Morrill. Missouri members are first named by the counties and municipalities to the ABCD Regional Planning Commission. This group then holds a caucus by county to name the 16 who will be the Mo-Kan Council voting members from Missouri. The council and the commission meet simultaneously each month to transact council business. Since 1982, Mo-Kan Regional Council has partnered with the Small Business Administration to provide commercial loans to area businesses in an effort to strengthen the region’s workforce and economy. Among Mo-Kan’s more recent additions to programming are hazard mitigation and homeland security. The Mo-Kan Regional Council Economic Development District is composed of six counties — four in Missouri and two in Kansas. The Missouri counties are Andrew, Buchanan, Clinton and DeKalb. The Kansas counties are Atchison and Doniphan. Mo-Kan has completed millions of dollars in grant and loan projects throughout the region over the years.